The 2nd anniversary of the famous Nyishi-Apatani summit celebrated here at befitting manner in grand way with various colourful and cultural programme. 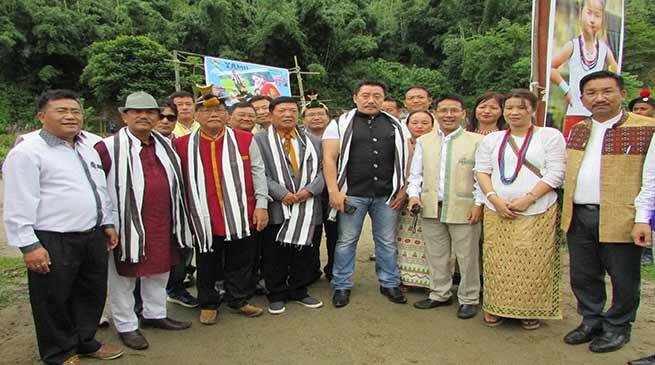 The relationship and commemoration of united effort of two major tribes of state Nyishi and Apatani began to start in 2013 and after it was given to ascent in way of joint declaration at a huge function held at Ziro in 2015 in presence of several community leaders of different tribes and the 1st anniversary was also held at Nirjuli wherein various community leaders were present. Addressing the gathering NES President Bengia Tolum said that relationship between Apatani and Nyishi have always been good which need to carry forward for strengthening the relationship which would pave the way for development and communal harmony and brotherhood. Both community are unavoidable neighbour. The relation should be from person to person and immediate neighbour and always stand behind during all time and hope that it would continue from decade to decade and appeal that let us unite together we stay for the development of area and state as a whole. There should be no problems between community if arise all need to be handled amiably by both community leaders. Tolum said that unity tower would be constructed shortly at Joram to mark NAS which shall reflect the unification of both community and said from next year we shall see that such programme may be celebrated as unity festival. TSD President Khoda Ruja while said that no decisive forces would divide us and need to maintain the cordial relation between Nyishi and Apatani community. The summit of 2015 was a bench mark of the commemoration of two community and the mutual love and affection and we need to keep it up for long cultural and social relationship. Attending the function Parliamentary Secretary and Ziro MLA Er. Tage Taki in his address said that the mental and physical coordination need to unite either community which shall share all happiness and sorrow for mitigating all problems in between arise out of any confrontation at any point of time. Parliamentary Secretary and local MLA Likha Saaya said the society will never change until the mindset and thinking is changed. The system of taking fine during accident etc is not a good sign and appeal for change.